The Kinematic Turn. Film in the Digital Era and Its Ten Problems (avec Philippe Marion), Montréal, Caboose, 2012, 51 p. Texte inédit en français publié directement en anglais dans une traduction de Timothy Barnard. Heralding the digital era of cinema as a return to its roots as a crossroads of other media and cultural practices, André Gaudreault and Philippe Marion challenge the prognosis that cinema is dying, arguing that cinema has always been more an ‘evolving patchwork of federated cultural series’ than a static form with a fixed identity. In a discussion ranging from early cinema, of which today’s media landscape a century later is an eerie reflection, to opera films in local movie theatres to the ‘return of cinema’s repressed’ – animation, and now performance capture – The Kinematic Turn: Film in the Digital Era and its Ten Problems lays out a roadmap for negotiating the issues that will confront cinema in the years ahead as it increasingly mingles with other media. 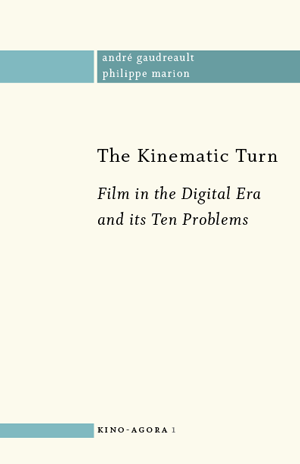 In the process the authors coin another neologism in their extensive repertoire, the ‘kinematic’, or the shift from the medium cinema to a convergence of moving image media, one that will engender a major ‘turn’ in study of the field. Ce contenu a été mis à jour le 7 août 2018 à 11 h 54 min.